A very warm welcome to the first of a new series of Product Profiles, where each month we'll be highlighting a seasonal flower, foliage, plant or sundry item. 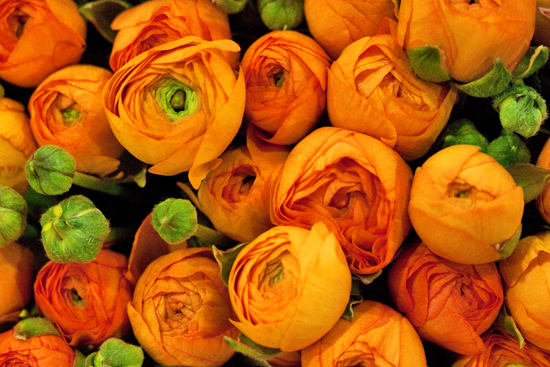 We're going to start the series with a look at a popular spring flower…the ranunculus. Ranunculus take their name from 'rana', the Latin for frog, which is perhaps linked to the fact that the plant likes to grow in damp conditions. 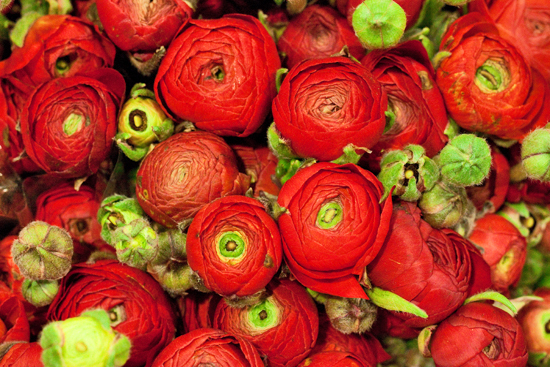 Their full Latin name is Ranunculus asiaticus. 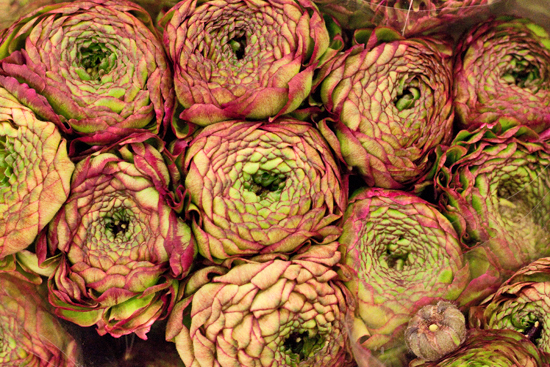 Ranunculus generally start to appear at the Market in November/December and are at their best from January, with their main season usually coming to an end in May/June. 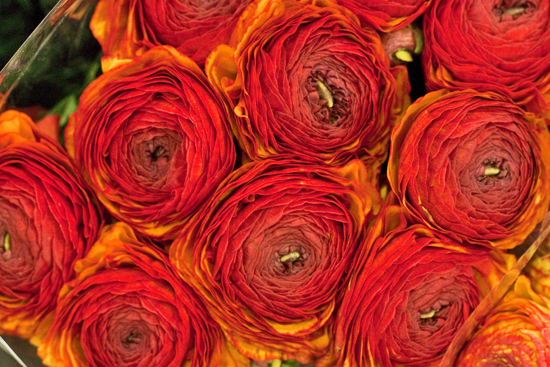 Not often found in supermarkets, apart from perhaps in amongst a mixed bunch of spring flowers, ranunculus can really be a 'point of difference' for you, when you sell them in your shop. 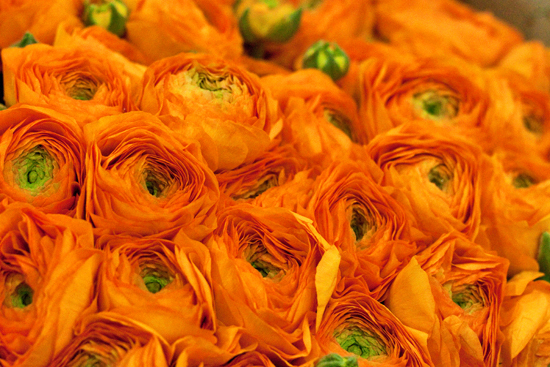 There are several different types of this pretty bloom at the Market, which is a member of the buttercup family. We'll start off with a look at the most common variety. 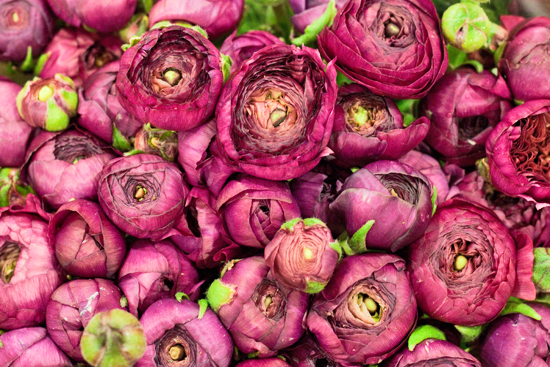 If you ask one of the Market traders for ranunculus, the one pictured above is what you'll get…a sort of 'standard' ranunculus. You'll find them in a dazzling array of colours including cerise, pale pink, orange, red, white, yellow and burgundy. 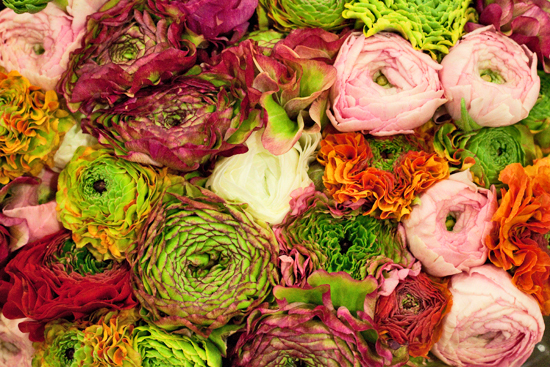 Italy appears to be the most popular place for the Market traders to source their ranunculus from, although there are also growers in Israel. 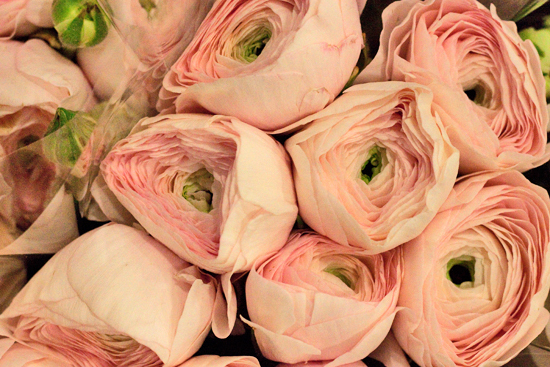 They're such feminine flowers with their layers upon layers of soft delicate petals. And each day as they open up, they look better and better, with the petals becoming more and more translucent. 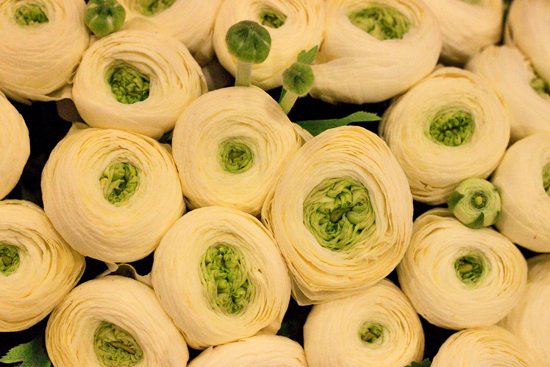 'Our ranunculus come from Italy in wraps of 50 stems – 5 x 10 stems in a bunch. They're generally priced around £0.40 per stem, so £20 a wrap…but the prices go up and down. 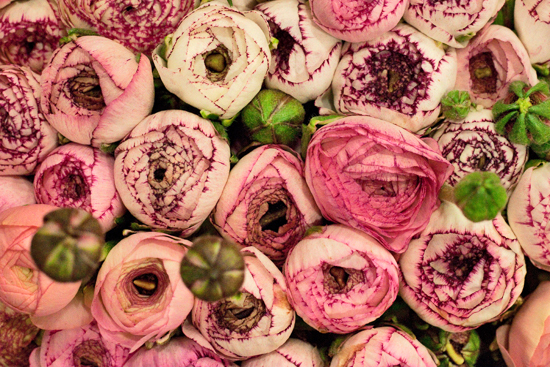 The Israeli ranunculus tend to be a little bit cheaper, but they aren't usually as full a bloom as those grown in Italy. 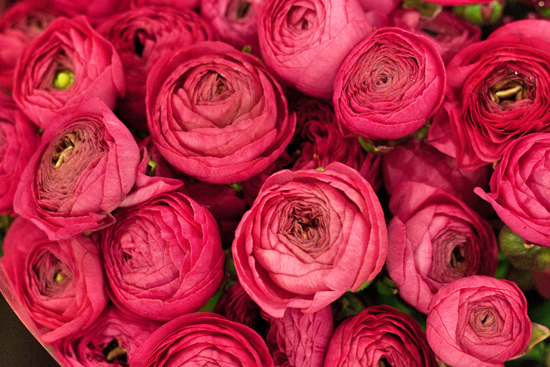 Certain colours of ranunculus can command a higher price, such as peach and soft pink. A relative newcomer to the ranunculus cut flower family is the Cloni ranunculus. There seem to be different ways of spelling it and pronouncing it, depending on who you speak to. Some people say Clone-y and some say Clooney. And I've seen it spelt as Clooney too…perhaps George has something to do with these stunning blooms?! I think the safe bet is to pronounce it as Clone-y. 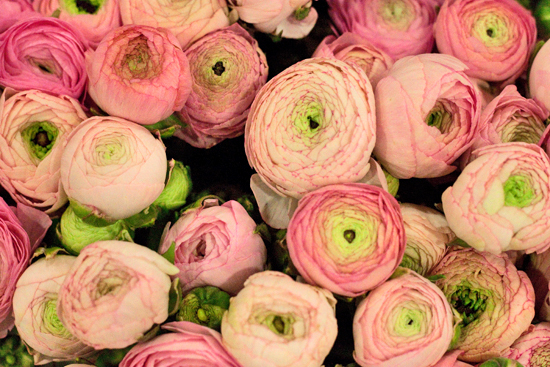 Grown in Italy, what sets them apart from standard ranunculus is their much larger flower heads. 'I sell them as an equivalent to a peony, as peonies are a similar price. And Cloni ranunculus petals have a very similar texture to the peony. 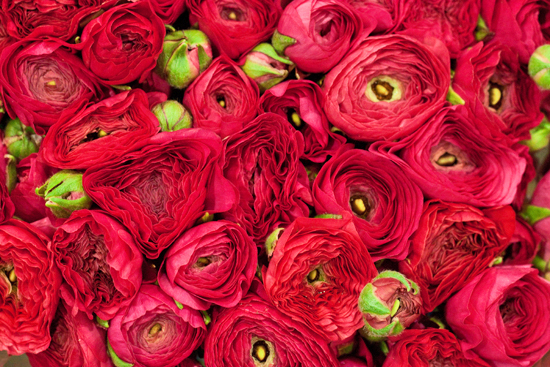 Cloni ranunculus are currently available in a limited range of colours, which include pale pink, orange, cerise, red and cream. They're popular for wedding work and the pale pink variety called Hanoi, which is pictured above, looks wonderful arranged on its own in a bridal bouquet. 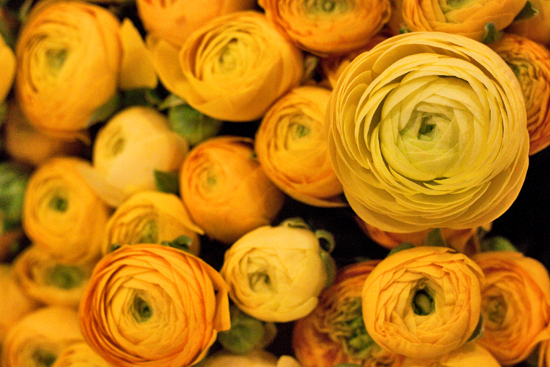 At Zest Flowers, they have the new Pon-Pon ranunculus in bunches of 10 stems. 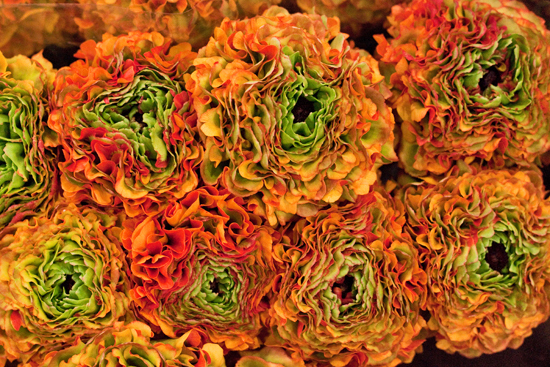 With unusual ruffled petals, they come in a range of colours including orange and purple. 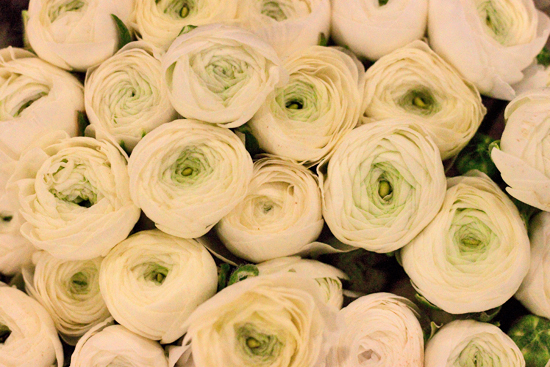 On Alagar's stand, they have these Cappuccino ranunculus with creamy white petals which have fuchsia coloured edges. 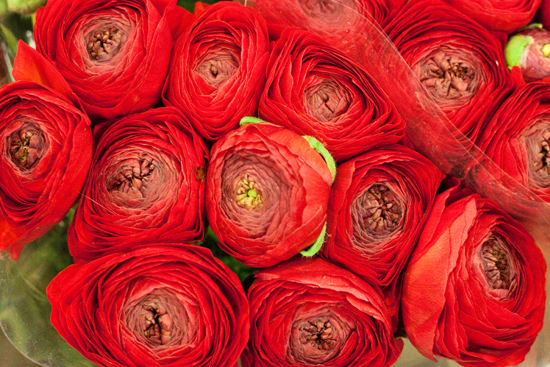 When you're buying ranunculus, check the flower heads for the condition of the petals. And also that the foliage is healthy and the stems are in good condition. One of the challenges with this beautiful bloom is that their hollow stems can sometimes become rotten and also bend due to the weight of the heavy flower heads. So, once you'd conditioned them, arrange them in a container that supports the heads. Vase life wise, the standard ranunculus generally lasts 7-10 days. 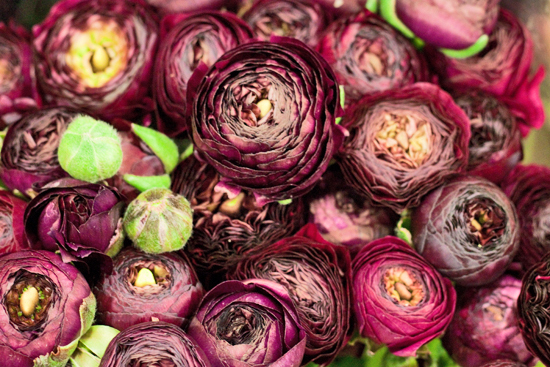 However, the Cloni ranunculus can last 2-3 weeks. With regards to how to use them, they much prefer to be arranged in water rather than floral foam. They're quite delicate blooms, so they like to be handled very carefully. I hope you've enjoyed reading through this first Product Profile.